I've already told you, haven't I, that won tons wrappers are easy to use, they don't require any flour because they don't stick to each other, they're so thin that the filling can be seen in transparency that it's a pleasure (and when the filling is purple, they are a such a jewel! ), they're delicate and all in all you can even get used to their different texture? Of course, if you really want to commit yourself and prepare won ton dough from scratch, well, we're back to the same problem, but for now I'm quite pleased with the ones I get at Whole Foods, so beautifully squared out and ready to use. And I just found out that you can freeze them right as they come, stacked one on top of the other in their package. If need be, simply take out the freezer the desired number of squares, and they - to my amazement and wonder - won't oppose any resistance, coming off with ease. 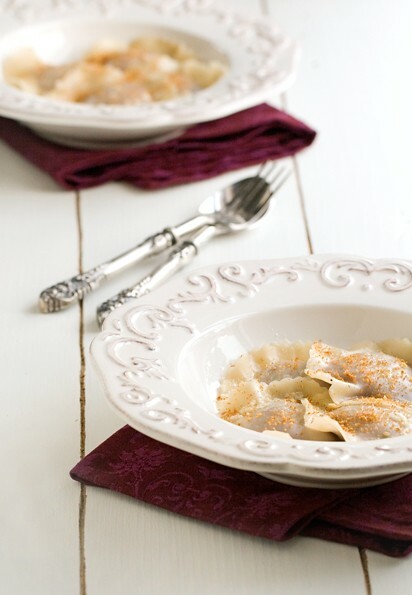 I wouldn't go as far as saying that won ton give you the best ravioli in the world, because it's not true and because, despite appearances, I'm terribly romantic and pasta - especially when done by hand - will always hold a special place in my heart. What I can assert with confidence is that won ton will give you the fastest ravioli in the West, and that they will make quite an impression on a Thursday evening dinner of any given week. purple potatoes about 500-600 gr. goat cheese about 60-70 gr. For the filling, wrap potatoes in foil and cook them in the oven at 425 for 30 or 40 minutes, until they're soft. Peel and mash them while still hot. Allow them to cool slightly, then add the Parmigiano, goat cheese, salt, pepper and some finely chopped chives. Knead the filling with your hands until the cheese is smooth and well blended. Place some won ton squares on the work surface (if you wish, cut them out with a ravioli cutter and give them a more proper shape...), and scoop a small amount of filling in the middle of each. Brush the edges with the egg white, slightly beaten (or with cold water), then cover each square with another won ton sheet, trying to eliminate any air bubble and pressing with your fingers to seal the ends. Cook the ravioli in simmering salted water, and drain them after two minutes or right when they come back to the surface. Dress them with melted butter and a spoon of bread crumbs previously toasted in a pan along with a minced garlic clove.